Adrian Hemming’s landscapes reveal a deep understanding of the natural world that both challenge and involve the viewer. ‘Travel is the master compass of my work,’ says Adrian Hemming whose description of himself as a landscape painter does scant justice to the breadth and diversity of his subjects. For here is an artist who possesses the unique ability to draw the viewer into the fundamental essence of the landscape and its very history, be it desert, mountain or sea. Colour and light are the key elements here, for these are far from being literal scenes but a distillation of the subject. 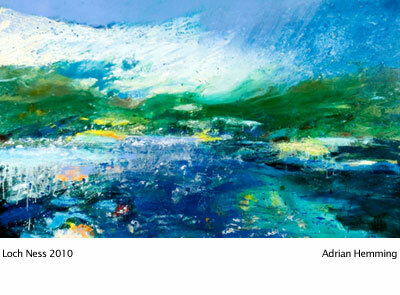 Indeed, Cezanne’s famous quote, ’I am not into painting views, I am into painting landscapes,’ could be similarly applied to Adrian Hemming, for here is an artist who is totally dedicated to his calling. An apprenticeship as an engineer in the East Midlands might seem the most unlikely of beginnings for an artist who passionately believes that painting, like poetry, still provides the onlooker with a direct communication. But as Adrian explains, this unusual early background meant that he had the ability to visualise subjects three-dimensionally, which was to prove invaluable as he progressed as an artist, having changed careers and commenced his studies far later than his fellow students. The emotion of painting is both his inspiration and driving force, although he admits to not finding it easy. His canvases are invariably big with strikingly bold colours, for there is a sheer physicality and joy to his work. His oil paints, like his subjects, are a true living medium, that obey their own natural process. There is an incredibly tactile nature to his paint and frequently its relief is a major contributor to the vibrancy of his canvases. It is this depth of understanding and thinking that has been the inspiration for his paintings of 30 million years of Antarctica that portray the land mass in living form with vegetation, fossils and minerals, long before its journey to the bottom of the world and the onset of the ice age. These canvases that mirror the shape of the new continent, break with tradition in being both massive and circular. His extensive travels see him sketching, painting or photographing a subject wherever he can; equally he does not set out to identify a particular location or tread the over-familiar tourist trail. Adrian maintains that he cannot pre-plan his work but only place himself in what he considers is a stimulating environment. He shares David Hockney’s view that it is the spontaneity of time, place and influence that produces the work. The quartet Apollo’s Eye and the Four Seasons, recently shown to considerable acclaim at the Three 5 Contemporary Gallery in Cyprus, represent a further departure in Adrian’s work. Robert Snell’s critique on the paintings indicate the drawing on the ideas of the pre-Socratic Greek philosophers who understood that existence was set into motion by mind or nous and this has been the inspiration for a fusion of light, motion and colour that is at once both innovative and surprising. Less known than his major canvases are Adrian’s watercolours that similarly feature his landscape treatments. The Piper at the Gates of Dawn, (oil on paper. Plein air) demonstrates his mastery of a medium that is both minimalist and uncompromising but uniquely suited to his style. Like his work in pen and ink and pastels, this is a further dimension to the Adrian Hemming portfolio.